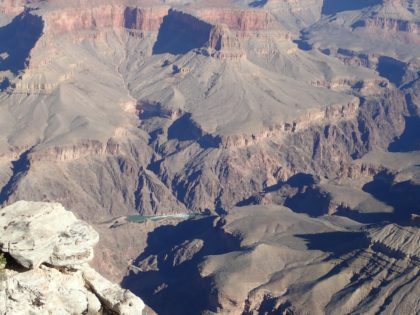 We have written about the Grand Canyon National Park before, but we’d like to share our most recent trip. We did this one differently. The allure of the Grand Canyon seems to always make us want to hike down into it, so we have never really taken the time to stay up top and explore. This time we took the Grand Canyon Railway from Williams (avoiding the traffic and parking headaches). You can take the train and leave the same day, but we stayed two nights in Grand Canyon Village. We did not go down into the canyon. Instead, we explored the rim; walking on many of the trails through the forrest including a short segment of the Arizona Scenic Trail. We also walked the entire Rim Trail – all 12.8 miles. 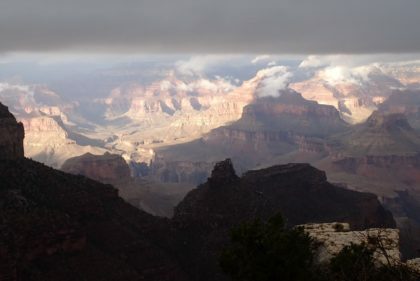 The Rim Trail extends from Hermit’s Rest in the west to the South Kaibab trailhead to the east – those are the farthest points that the free shuttle busses serve. You can take the bus and start from either end. You can even split it into sections and walk a part of the rim trail each day; take the shuttle to a point and walk to another shuttle stop. It’s easy! East to West? or West to East? We asked two locals and got two answers. One said east to west would be less climbing; the other said that west to east would be less climbing. So, we flipped a coin and began by going west to east. 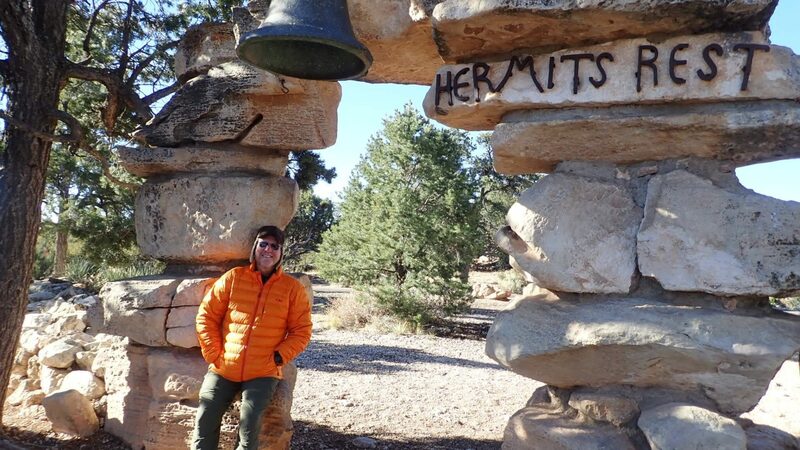 We took the shuttle to Hermit’s Rest, walked back to the Grand Canyon Village for lunch, then took the shuttle to the South Kaibab trailhead and walked back to the village. So, really we did both west to east AND east to west. In all, it was only about 950 feet elevation gain over the entire walk and the canyon views were gorgeous all the way along. Much of the trail is paved, so it is easily accessible for all ages and abilities. This was our favorite part of the trail, probably because we got out early before the park began to wake up. Between March 1st and November 30th, private vehicles are not allowed to drive to Hermit’s Rest, but there are lots of shuttles. Early morning is the quietest and most peaceful time to walk the rim. We ran into very few people until we got closer to Trailview Overlook. Hermit’s Rest was open when we arrived and it was fun to talk to the folks there about the history and to check out the building; one of the many designed by architect Mary Colter. She was the chief architect and decorator of Fred Harvey Company, behind many of the famous buildings you will see when you visit the South Rim – Hermit’s Rest, Hopi House, Lookout Studio, Bright Angel Lodge and Desert Watchtower. As you walk along the Rim Trail, take your time to enjoy the sights and sounds. Each viewpoint offers a different look into the canyon; from some you can see the Colorado River and you may even hear the sound of the distant Cascade Rapids. 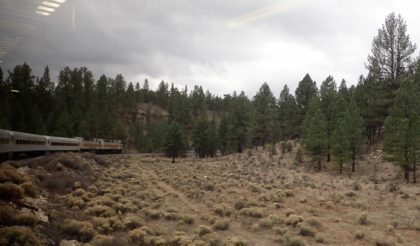 You can also see the many of the trails that criss-cross the canyon floor. The view changes at each turn – the colors, shapes, shadows. If you are like us you will take way too many photos, because each view looks even more spectacular than the last! 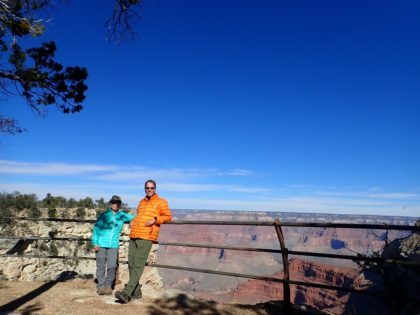 This section of the trail is a combination of paved bike path and unpaved trail winding along the canyon rim, with lots of picnic tables and benches along the way where you can stop and enjoy the view. We were amazed how close to the edge much of the trail was. One section called “The Abyss” is just that – you look straight down – not for folks with a fear of heights! The next section of the Rim Trail is through the Grand Canyon Village, a more crowded area with restaurants, lodging and shops. Here you will encounter more historic buildings. 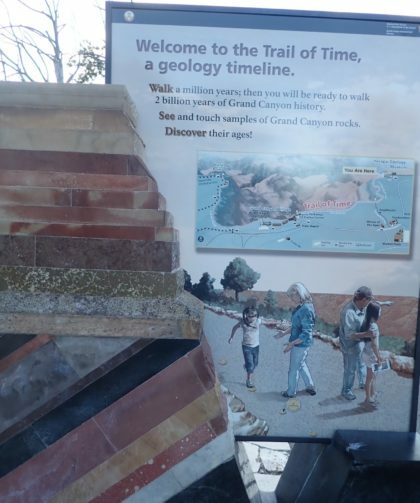 Stop by the Bright Angel Lodge and check out the geological fireplace; built by Mary Colter with layered stones that match the geological sequence of the Grand Canyon. Take a moment to sit on a rocking chair at the historic El Tovar Hotel, built in 1903. Drop into the Hopi House – not only Mary Colter’s first building at the Grand Canyon but a fun shop with lots of Native American arts and crafts. Keep your eye out for animals. There are a bunch of deer who call the village home and we also saw a grey fox there. But watch out for the carnivorous squirrels! If you hold out a french fry for them, these smart little fellers know that if they bite you, you’ll drop the entire plate of fries and they’ll get them all!!! 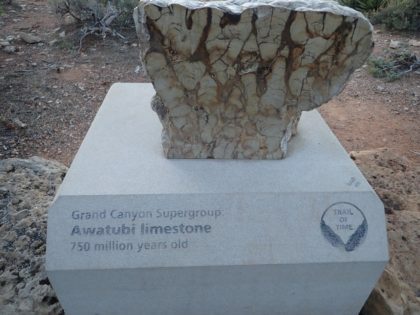 This last section of the trail lets you walk in the footsteps of geological time. 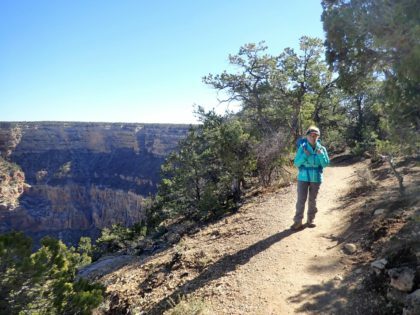 It’s the “Trail in Time” – a walk through 2 billion years of Grand Canyon History. We thought it was really cool how the National Park Service displayed rocks from the various layers – schist, granite, limestone, sandstone, and more – displayed along with the age. Of course, like every other section of the Rim Trail, the views are spectacular. Mather Point seems to be especially popular; where everyone goes for the best sunset photos! It is also a short walk from the Grand Canyon Visitor Center so it gets lots of people. We were a bit dismayed to see how many folks were off the trail and climbing out on the rock ledges. Please be careful! It’s not worth your life to get the perfect selfie. People die at the Grand Canyon each year from getting too close to the edge. 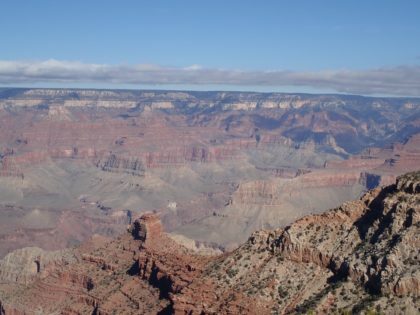 Many of the viewpoints on this section are busy – the Grand Canyon National Park is the second most visited national park – but you can get away from the crowds if you walk farther from the shuttle stops in any direction. Only then will you really experience the peace and solitude of the Grand Canyon. You may also see more animals – we saw a couple elk grazing in the forrest. Very cool. The far eastern end of the trail is the South Kaibab Trailhead, built in the 1920’s by the National Park Service to offer folks an alternative trail down to the canyon floor. At the time, there was private ownership and tourists were charged a fee if they wanted to go down the Bright Angel trail. The National Park Service wanted to limit private ownership and offer trail that would be free. Today the South Kaibab trail is part of the Arizona Scenic Trail – an 800 mile trail that traverses the state; beginning at the Mexican border and ending at the border of Arizona and Utah. That’s a trail we hope to do one day. Looking forward into 2019, you may want to include a visit to the Grand Canyon. It’s a special year – the 100th birthday of Grand Canyon National Park. If you do get a chance to visit, don’t just stop at the overlooks and take photos. 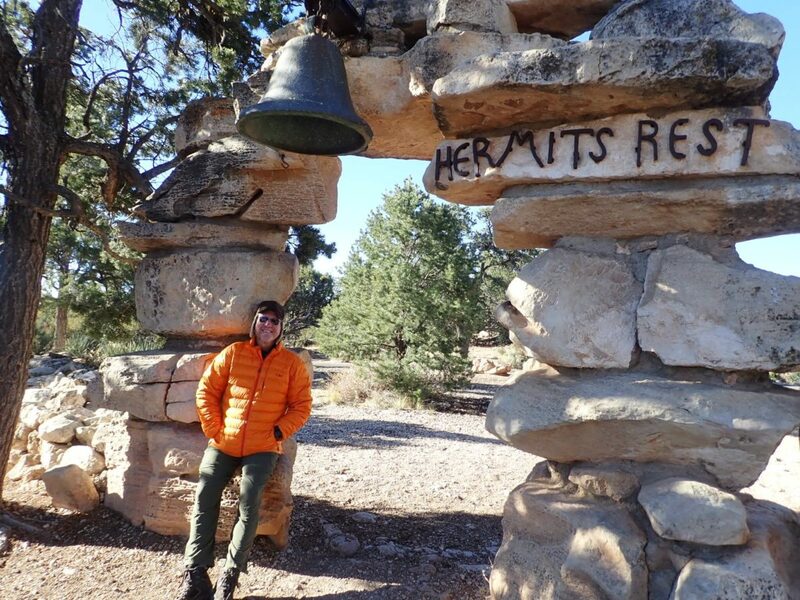 Take the time to explore, and take in as much of the Rim Trail and the other trails as you can. We enjoyed it so much we’ll be back, but next time to hike and camp at the bottom! Stay tuned.